Involute gears must all mesh correctly with a rack. A rack is just a gear with an infinite number of teeth. For most model engineer purposes we don’t need perfect involute teeth – just a close approximation. To make the cutter we need to know the pressure angle and pitch of the gears to be cut. In my case it was 20 degrees, 0.5 module. The module system is simple enough as it is the reciprocal of the DP system. For example, a 48 tooth, 0.5 module gear will have a 24mm pitch circle diameter. Each cut will be right to the nearest thou. For the expert among you, you might like to try to do better. The hob is to be made from half inch silver steel (drill rod). It will be important for the cutter to be mounted such that the teeth are truly concentric to the shaft. As the cutter will be mounted in a Clarkson type milling chuck, it seemed best to arrange for all the critical machining to take place while mounted in the chuck. 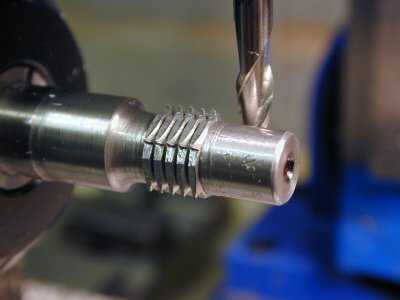 To do that, I first cut a length of bar, mounted it in the four jaw chuck, faced and centre drilled one end. 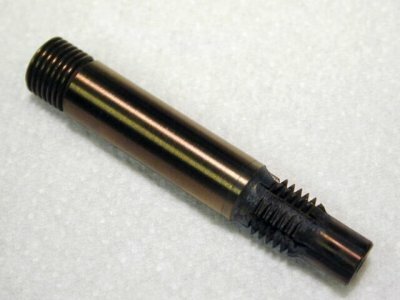 A 20tpi thread is cut to allow this end to be mounted in my posilock chuck. 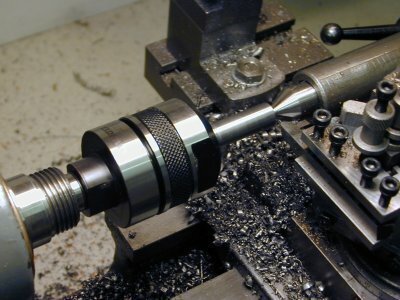 That done, the prepared blanks is securely mounted up in the milling chuck on the lathe headstock and a precautionary skim taken to ensure everything is concentric and clean. The end is faced, centre drilled and supported with a tailstock centre for the next bit. So, now I need to cut a half inch silver steel (drill rod) bar to leave five circular rack forms on it. The cutter for this is a sharp vee shaped cutter like a threading tool but with an included angle of twice the pressure angle of my gears – 40 degrees. Depth of cut is given in the page on involute forms. At this point, you should be able to present an existing gear of the right type to the cutter and see a good mesh with a bit of clearance at the root of the teeth both on the cutter and the gear. These lovely rings now need to be converted into cutting teeth. The simplest way (as ever – not the best) was to relieve the trailing edges of the teeth in the mill. 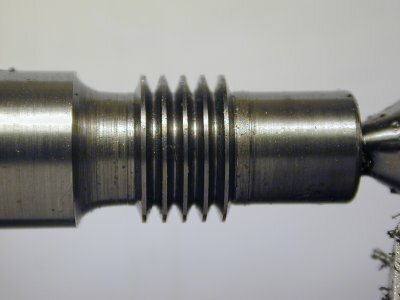 The milling chuck is transferred, without disturbing the cutter, to a rotary table and a few passes with an end mill form the teeth. Remember which way the cutter will run when you do this. 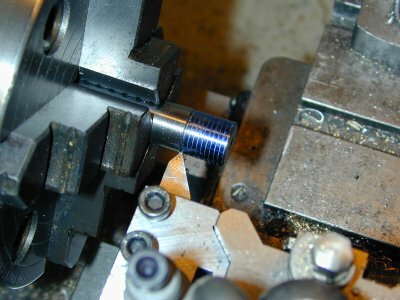 Only about 10 thou of the rings is left at full diameter, allowing some scope for sharpening without losing the tooth profile. Unless you are going to make gears from balsa wood, it would be a good idea to harden this up. Remove from the chuck and heat until bright red – cooked carrots, not those dark cherries and quench, vertically in water or brine. If you are going to wreck your cutter that will be when you do it. I tempered mine by putting it in the oven at 220deg C for an hour and allowing it to cool naturally. More reliable than reheating and quenching. This is actually an earlier example but it looks pretty good to me so I included it here.